Ryan Laplante is a WSOP bracelet winner with more than $1.4 million in lifetime live tournament earnings. In recent months he has taken to tweeting out hand histories when he plays tournaments, breaking hands down into multiple decsion points and allowing his Twitter followers to vote on how to play the hand. He is in the field today and has started to up with the choose-your-line tweets here in the CPPT main event. What would you do with K Q in this spot below? Jim Carroll raised to 10,000 from middle position and Peter Bercovich, Paul Volpe, Ryan Laplante and Ben Zamani made the call. The flop brought the J 7 5 and Carroll bet out 21,000. Bercovich made the call, as did Volpe. Laplante then moved all-in for 189,000. It folded around to Volpe, who went into the tank before making the call with the 9 8 for a double gutshot straight draw and flush draw. Laplante held the Q Q for an overpair. The turn brought the Q to give Laplante a set. The 3 on the ricer improved neither player and Laplante increased his stack to 490,000. Volpe was left with less than 80,000 after the hand. From under the gun+1 Hyon Kim raised to 7,000 and Ryan Laplante made the call in the hijack. The player in the small blind moved all-in for 56,500. Kim folded but Laplante quickly called with the 8 8 . The small blind player held the A J . It was a coin flip going into the flop, but Laplante quickly jumped out to a huge lead when the first three brought the K 8 6 . The 3 on the turn and the J on the river secured the pot for Laplante, who knocked out his opponent and chipped up to 194,000. From under-the-gun Matt Glantz raised to 3,500. Paul Hoefer made the call on his left and it folded to Ryan Laplante in the big blind. Laplante made the call and the flop brought the 9 9 8 . Laplante checked and Glantz bet 5,500. Hoefer called and Laplante called as well. The turn brought the 3 and Laplante checked again. Glantz fired out a bet of 16,000 now, drawing a quick fold from Hoefer. Laplante thought it over for a moment before deciding to slide out a re-raise to 55,000. Glantz considered the situation for a while, but he eventually elected to fold. Laplante showed the 3 as he raked in the sizable pot. Laplante now sits with 205,000. Ryan Laplante moved all-in for about 145,000 and was called by Paul Volpe in the big blind. Laplante showed A 9 , but he was dominated by A J . The board fell 8 7 2 K 5 and Laplante was sent to the rail. Ryan Laplante raised to 20,000 from the cutoff and Daniel Frumkin shipped 244,000 from the button. Laplante thought it over for nearly a minute before tossing in the call, showing A 10 . Frumkin had him dominated with A Q , but the board ran out J 6 2 10 J and Frumkin was eliminated. Laplante now has 830,000 in chips. Ben Zamani raised to 16,000 and was called by both Ryan Laplante and Daniel Frumkin in the blinds. The flop of K 5 3 caused both blinds to check to Zamani, who fired in a continuation bet of 18,000. Laplante was the only caller, and the turn was the Q . Laplante checked, and Zamani bet 38,000. Laplante called, and the two players saw the A hit the river. Both players checked, and Laplante showed K Q to win the pot. He now has about 430,000. The player in the cutoff raised to 2,500 and the player in the small blind three bet to an unclear amount. In the big blind Ryan Laplante looked down at his hand and made it 16,500 to go. The player in the cutoff got out of the way and the small blind moved all-in. Laplante snap called and revealed the A A . His opponent was on the bad end of the worst pre-flop cooler with K K .
The board ran out 10 4 3 J 5 and Laplante secured the knockout. The 2016 WSOP bracelet winner now sits with 296,000. My Summer Stats: (Assuming I dont cash this 5k). Have 166k for bb600 from 25k start stack in the last mtt of the summer. (5k with 3mil Prizepool likely). Tough table and long grind 2day. Daniel Dizenzo raised and Ryan Laplante moved all-in for about 100,000. Dizenzo called with J J and Laplante showed A Q for a race situation. The board fell K 10 9 9 2 and Laplante was eliminated. Dizenzo is now up to 980,000. After a series of preflop raises, Alex Rocha found himself all in for his last 54,000 or so with A Q against the pocket jacks of Ryan Laplante. The board ran out 10 high and Rocha was eliminated. Laplante now has 340,000 after winning the flip. 372k, bb3k, 10 from $$. Some news from the Twittersphere! Kenna James and Randy Ohel are firing for a second time today, while John Eaton and Ryan LaPlante are on bullet number one! Robert Notkin is in town from Toronto to play one of his favorite tournaments and is doing well early on! Didn't fair well in yesterdays @WynnPoker Main. "It's not whether you get knocked down, it's whether you get back up"-Lombardi Day 1B today. Round 2 vs. @WynnPoker Fight! Ryan Laplante was all in with K Q against Keven Stammen’s A K on a J 10 7 7 9 board and was eliminated. Laplante took home $5,052 as the 26ht place finisher. Ryan Laplante had a pretty good day yesterday and bagged 74,000. He took to Twitter this morning to let everyone know he plans to do even better today! Max Steinberg opened the button for 50,000, Ryan Laplante moved all in for about 450,000, Dylan Hortin re-shoved the big blind and Steinberg folded. Hortin led with J J against Laplante’s A Q . The board came 10 9 6 2 K , offering no help to Ryan Laplante who was eliminated in 7th place ($56,372). 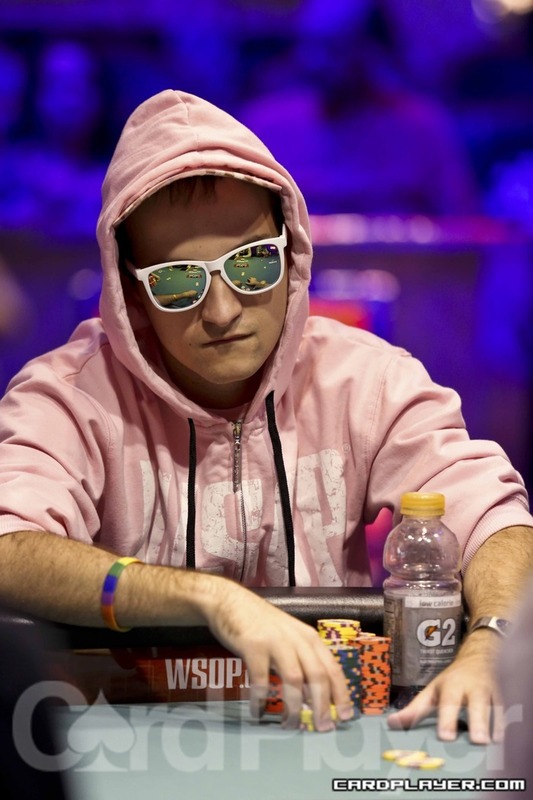 Hortin secured the chip lead that hand with about 2.85 million. Be sure to check back with Card Player at the conclusion of each level for regular updates with all of the action, current chip counts, and prize distributions. The final table of Event no. 33 ($1,000 No-Limit Hold’em) is now underway, and Card Player will be posting level-by-level updates with all of the action, current chip counts, and prize distributions. Day 3 began with 15 players spread out over 2 tables, and with the elimination of Mikhail Timoshin in 10th Place ($25,331), the final table is now set. Play will begin in Level 23 with blinds of 10,000-20,000 with a 3,000 ante, and will continue until a winner is determined. It took quite a while to get the first elimination at this final table, and it resulted in a double-knockout. Christopher Homan opened for 90,000, Arkadiy Tsinis moved all in from the button, Ryan Laplante re-shoved from the big blind and Homan called all in. Homan was ahead before the flop, but the board came Q 10 7 10 8 , giving Tsinis top set on the flop and a full house on the turn to eliminate both players in the same hand and take the chip lead for 2.3 million. Based on their chip counts entering the hand, Christopher Homan was eliminated in 9th place ($39,756) while Ryan Laplante was eliminated in 8th place ($51,711). Randolph Lanosga opened for 150,000, David Rounik moved all in from the small blind for 570,000 and Lanosga called. Rounik lead with A 9 against Lanosga’s Q J . The board came K J 8 9 3 , giving Lanosga middle pair on flop to win the pot. David Rounik was eliminated in 7th Place ($68,209). Perry Lin moved all in before the flop for 475,000 and Randolph Lanosga called. Lanosga lead with J J against Lin’s A 9 . The board came 10 8 2 10 7 , no help for Perry Lin who was eliminated in 6th place ($91,010). Be sure to check back hourly for level-by-level updates of this final table. NOTE: Play ended last night with 23 players and resumed today at 3:00pm. The final 10 players consolidated to one table, and with the elimination of Daniel Aldridge in 10th place ($31,219), the official nine-handed final table is now underway.